After a rather long absence, both Amer Fatuhi and Burhan Saleh recently presented worthwhile efforts in their exhibition round the theme "The Siege". 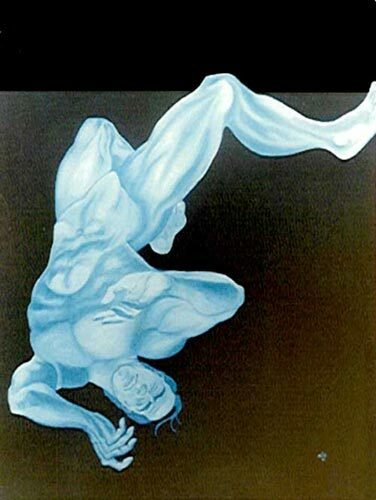 Held at the Iraqi Modern Art Center, the exhibition is number nine in the series of new Experiences launched by the Arts Department in 1991 and is still on. The series form an opportunity offered by the Art Department to the post-1960s generations of artists, especially those with exceptional talents. In the meanwhile, the department meant to open a dialogue among this category of artists. 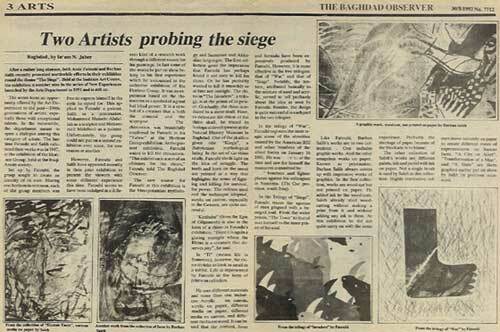 The last time Fatuhi and Saleh exhibited their works was in 1987, at the exhibition of the Horizon Group, held at the Iraqi Plastic "Visual" Artists Society. Set up by Fatuhi, the group sought to create an identity of its own. Having one horizon in common, each of the group members was free to express himself in the style he opted for. This applied to Fatuhi a painter, Saleh as a printmaker, Mohammed-Hussein Abdullah as a sculptor and Mohammed Mahthoul as a painter. Unfortunately, the group could not put on a second exhibit ever since, for one reason or another. However, Fatuhi and Saleh have appeared recently in their joint exhibition to present the viewers with some different experience this time. Fatuhi seems to have been indulged in a different kind of research work through a different source for his paintings. In fact, some of the works he put on show belong to his first experience which he announced in the collective exhibition of the Horizon Group. It was an experience based on the rhinoceros as a symbol of Agreat but blind power". It is a symbol of a creature that is both the criminal and the scapegoat. The rhinoceros was beautifully employed by Fatuhi in his art work "Taboo" at the Horizon Group exhibition. Fatuhi wants to kill the rhinoceros. "This exhibition is a sort of an obituary for the rhino", Fatuhi told the Baghdad Observer. The new source for Fatuhi at this exhibition is the Mesopotamian mythology and Sumerian and Akkadian languages. The first collection gives the impression that Fatuhi has perhaps found it not easy to kill his rhino. Or he has probably wanted to kill it smoothly or at best not outright. The rhino in "The Invaders", a trilogy, is at the prime of its power. Gradually, the rhino is reduced to a mere skull. Here, to delineate his vision of the rhino skull, he traced its biological development at the Natural History Museum in Baghdad. One of the skulls is given title "Kingu", a Babylonian Mythological being. In the set of the rhino skulls, Fatuhi sheds light on the idea of struggle. The teeth and horn on the snout are painted in a way that highlights the sense of fighting and killing for survival, for power. The colors used and the technique adopted, acrylic on canvas, especially in the Genesis, are quite successful. "Khimbaba" (from the epic of Gilgamesh) is also in the form of a rhino in Fatuhi’s exhibition. "Here it is again a glaring example where the Rhino is a creature that deserves pity", he said. In "Ti" (means life in Sumerian), however, the rhino shrinks to look as small as a rabbit. Life is represented by Fatuhi in the form of prints on cylinders. He uses different materials and more than one technique: Acrylic on canvas, acrylic on paper, mixed media on paper, mixed media on canvas, and mixed media on wood. It can be said that the content, form and formula have been expressively produced by Fatuhi. However, it is more effective in the two trilogies: that of "War" and that of "Siege". Notably, the texture, attributed basically to the mixture of sand and acrylic, served to tell profusely about the idea as seen by Fatuhi. Besides, the design is quite successful in each part in the two trilogies. In the trilogy of "War", Fatuhi registers the most tragic scene of the atrocities caused by the B52 and other bombers of the allied forces on January 16, 1991. He was reservist at the time and saw for himself the massacres committed by the allied’ bombers and fighter planes. In the trilogy of "Siege", Fatuhi traces the agonies of man plagued with a besieged soul. From the wider prison, "The Town" to that of man himself to the inner prison of his soul. Like Fatuhi, Burhan Saleh’s works are in two collections. One includes graphic works and the other compromises works on paper. Known as a printmaker, Burhan Saleh always comes up with impressive works of graphics. In the first collection, works are wood-cut but not printed on paper. He added ink to the wood cuts. Saleh already tried wood-cutting without making a print from it and without adding any ink to them. At this exhibition he did not quite carry on with the same experience. Probably the shortage of paper because the blockade is to blame. The other collection of Saleh’s works are different paints, ink and pastels with ink on paper. Not a single brushed is used by Saleh in this collection. Highly contrastive colors move violently on paper to create different states of expressiveness on human faces. "A City on Alert", "Transformation of a Man", and "A State" are three graphics earlier put on show by Saleh on previous occasions.